As you know, Advance Tree Pros is very proud to have not one, not two, but THREE ISA Certified Arborists in the Orlando/Central Florida area. But what exactly does that mean? What is an arborist and why should you care that an arborist is certified? Basically, arborists are tree doctors. Dictionary.com defines arborist this way: “a specialist in the cultivation and care of trees and shrubs, including tree surgery, the diagnosis, treatment, and prevention of tree diseases, and the control of pests.” It is our job to determine what problems a tree or shrub is having and then address those problems. Often, this results in trimming off dead limbs, but there are times when we will recommend removing a tree, especially when the tree in question is a potential threat to the safety of others or a health risk to other nearby trees or vegetation. You might be surprised to know that every time you trim a tree, you are causing stress to the tree and reducing its potential for photosynthesis. Because of this, pruning should only be done with a specific purpose in mind. Proper pruning can be helpful in many ways, but should always be done with the minimum amount of live matter removed. A Certified Arborist (CA) is a professional who has over three years of documented and verified experience and has passed a rigorous written test from the International Society of Arboriculture, an international non-profit organization. Having such a certification not only demonstrates that one has the proper knowledge and skills; it also shows that there is a high level of dedication to our profession and to our community. With so many opportunists out there who simply want to make a quick buck, can you really afford to hire someone who is NOT certified? 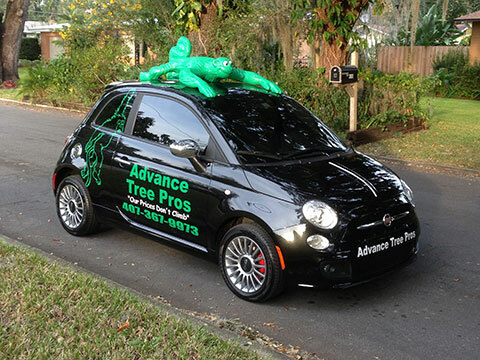 If you’re looking for a company that has served the community for many years and is fully qualified, look no further than Advance Tree Pros. With three ISA Certified Arborists and a superior fleet of our own heavy-duty equipment, we are the obvious choice for all your tree care needs. Pick up the phone today and give us a call at 407-271-1944!